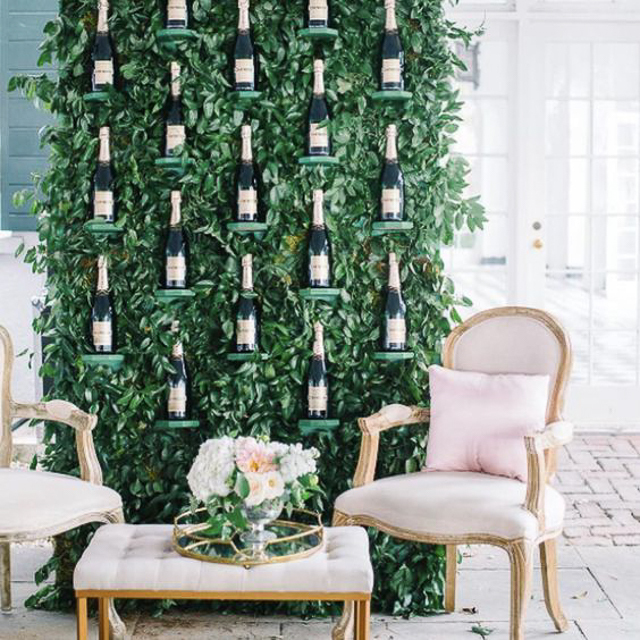 Last Monday, my mom and I sat down with our wedding planners in Charleston to talk about the design and style of the wedding. I showed them a bunch of inspiration photos that I had been saving on my phone – I’m going to share them here too. Here’s a little bit of info to keep in mind about our venue: it’s outdoors, and we will have a large white tent to keep it a little cooler (June in Charleston can be HOT!). 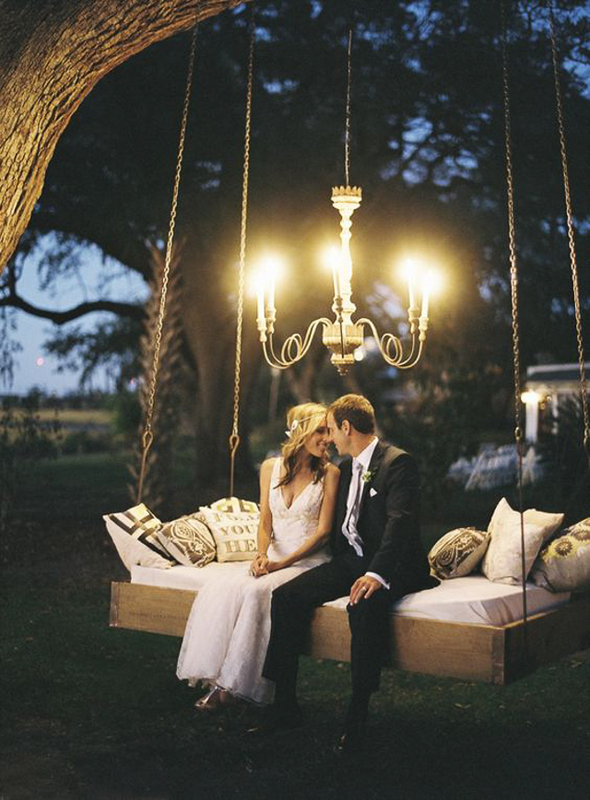 I want it to have an elegant fairytale garden type of feel – lots of fairy lights and chandeliers! 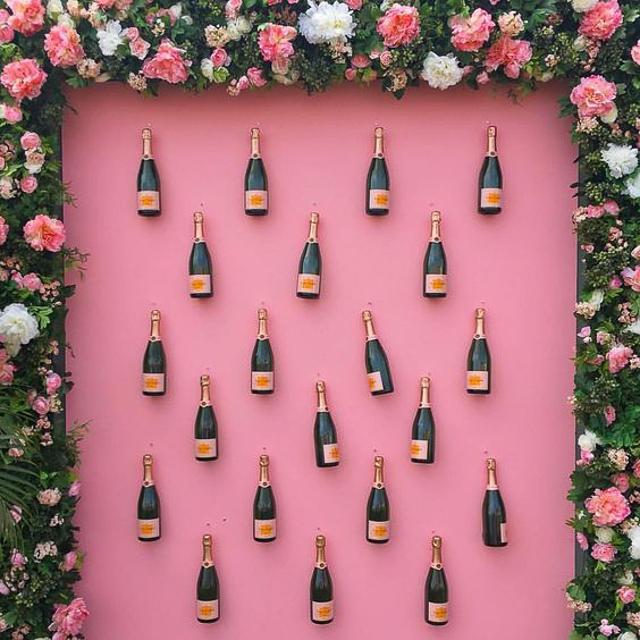 I’m thinking a champagne wall is a must-have! Look how amazing this is! Here’s another example. I really love the pink background in this one! There are a lot of large trees at our venue, how beautiful would it be to have chandeliers hanging from the trees at night? 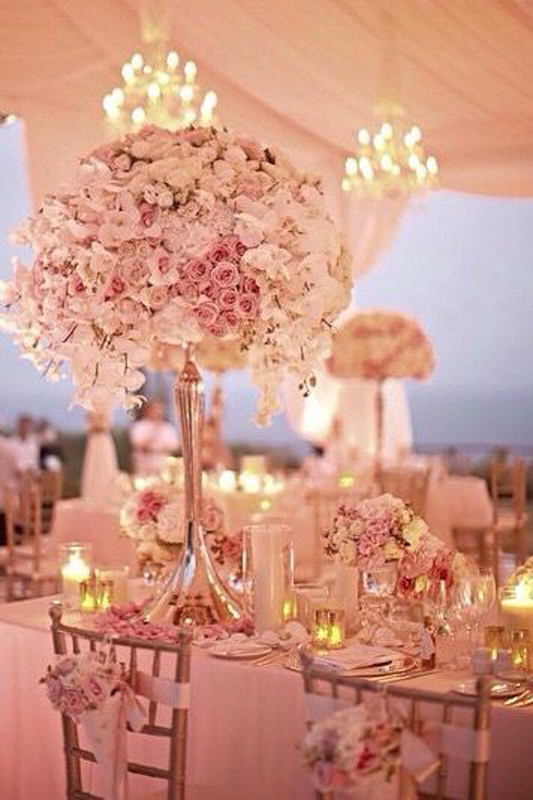 I just love the romantic feel of this set-up! 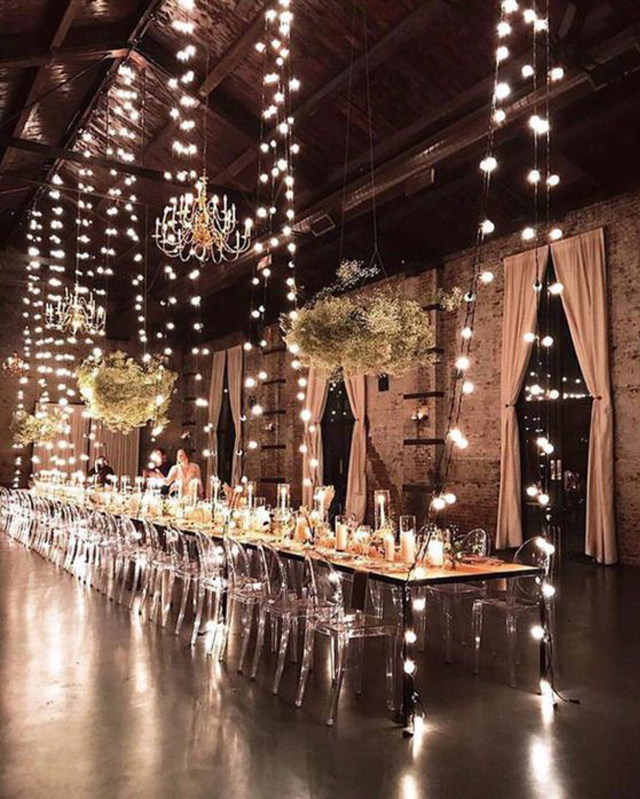 Give me all the fairy lights!! Another great inspiration image – I seriously can’t get enough of those chandeliers. I also love the incorporation of greenery and the very “natural” feel of the tables and chairs. Stay tuned because I still have some more wedding content coming up! Oh and like I said earlier I would love your advice on whether or not a videographer is worth it! Consider hiring Matt @ Staffordproductions .net I have no connection but watching his wedding videos is addicting!! He does amazing work! Your wedding sounds like it will be beautiful based off of your inspiration!! Can’t wait to follow along! So inspiring. I love your inspiration pics. So well-organized! I'm very impressed! Oh my goodness I’m so excited to see it! We got married here in June and Charleston weddings are just so incredible. I love walking around during wedding season and taking photos of brides and bridal parties and even guests just walking around. Anyway, videographer. I was on the fence as well and then kept seeing cute videos of the bride and groom getting ready and I decided to take the plunge and I’m so glad we did. I got the ceremony and all of the speeches which was all just a blur. This way I can go back and remember them. But what really meant a lot was having video of my grandparents dancing. My grandfather passed away suddenly a few months after our wedding and I actually pulled together all of the video of them dancing and made a short of it for everyone on that side of the family. Having video of my father giving a speech and my husband and mines first dance will also be cherished for a long time. HI Cait, to be honest with you the videographer is very important! we did not get one and now we could kick ourselves. we only have short video clips that friends had made on their phones of our fist dance and cutting the cake. it is such a special day my advice to you = the day goes so quickly before you know it, you saying goodbye to your guests and one of the most amazing days of your life is finished…GET A VIDEOGRAPHER YOU WONT REGRET IT!! Lovies Dorne'Correia South Africa. A videographer is 100% worth it! Anytime I talk to a married friend that is the one thing they all say they regret not getting. Although photos do a great job, nothing will capture those precious memories like video. Years from now, you'll watch a video of your wedding and laugh/cry over the moment. Something about it being 'live' is worth it to have a videographer along with a photographer! Having a videographer was the best choice we made. We watch it every year! Plus, I love the thought of our kids watching it. Every year we seem to find something that we missed the year before when we watched it. Sounds like you are right on track! I def think booking a videographer is a great idea! 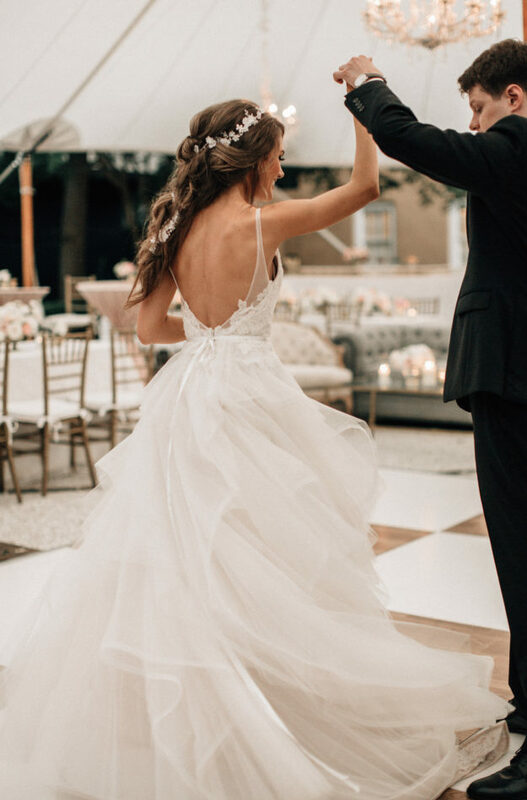 My husband and I love look back at ours and relive the best day of our lives! I love you wedding ideas. They are beautiful. I think you should get a videographer. Like many have said it is nice to watch it again and you could show this to your children one day. 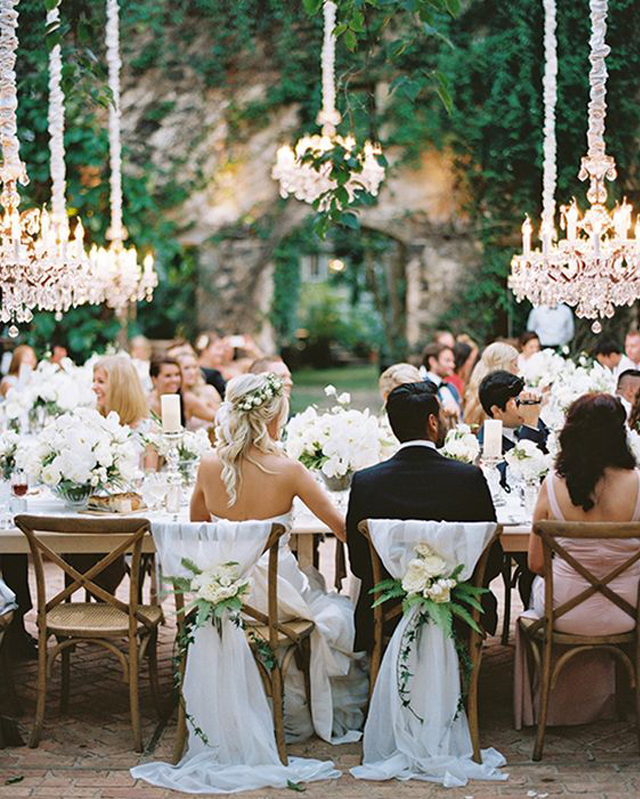 Love the idea of a fairytale garden wedding. My husband and I nearly got married in Charleston as well, but ALL of our friends and family are up in MA so we did a beach wedding at The Cape. We did exactly what you are stuck on, nixed the videographer for more flowers. I am SO happy with it because the photos are stunning, and I never imagined us cuddling up on a Saturday night and popping in our wedding video. The clips our friends took, our photos, and our memories are enough for me. Good luck with the process! Can't wait to see what you come up with. I'm loving all of your ideas! I cannot wait to see your wedding photos! They're going to be amazing! You'll be such a lovely bride! I have no doubt that it will all be beautiful:) Don't worry, it will all come together. A videographer is totally worth it!! My best friend runs a videographer business and she had so many brides hesitant about spending the money on it and every single one said it was the best decision. You won't regret it! I didn't have a videographer and do NOT regret it. Know yourself – I hate watching video of myself and didn't think my wedding would be any different. I didn't like the idea of an intrusive video/mic situation, either. FWIW, don't blow your budget on flowers. While lovely to set the mood, prioritize what guests will remember most – venue, food, drink, and dancing! Consider a few larger arrangements that can be moved around as the event progresses, but small arrangements on the tables (bonus: your guests can see each other and talk more easily!). My husband and I got married on Kauai and had a huge reception when we returned home! We had a videographer for both events and I am so glad we did! Yes, you will have all the pictures but the videos are so fun and emotional to go back and watch. Everything goes by so quickly that day, you will love that you have these to go back and watch with your husband. We try and watch them on our anniversary which is always fun! Then, when you have kids someday you will be able to show the video them them as well. I hope this help. Congrats on your upcoming BIG day!! YES on the video!! If you don't, you will regret it later on. Our kids enjoyed seeing it when they were younger, it captures emotions the camera cannot. It is also nice to remember some of our family members that are no longer here that our kids never met. If you don't want to spend a lot of money find someone that is just starting out that needs the experience — it will be good for them and cheaper for you, but you will still have memories on tape! Hi Caitlin! I'm getting married in October in Atlantic Beach, NC. I have been told by so many friends who have had a videographer that they 100% are happy with the decision they made to do it! The friends who haven't gotten one all have told me they regret it! I'm using Chad Winstead based out of Greenville and he will be doing my photography and videography. My wedding is outdoors so I really want a drone to capture it from above, those are some of my favorite! If anything, I want it to be something we can at least watch on our anniversaries! I decided to spend less on flowers and more on photography and videography since those are the things I'll keep forever! Good luck with your planning, hope you're having as much fun as I am! My husband and I booked the cheapest videographer we could find because we weren't sure about it either! The video is seriously so bad that its laughable, but I'm glad we have it! We watch it every year on our anniversary and laugh about it. In hind sight, I'm glad we went ahead and did it! I got married 14 years ago and hired an inexpensive videographer at the last minute. Even though the quality wasn't that great, my kids love watching our first dance and that's priceless. Do the videographer! We didn't spend a ton on ours since the pictures were more important but it's still super fun to have video of the day from our ceremony to seeing everyone dancing at the end of the night! I waited until the last minute to decide on a videographer, as I initially thought I wouldn't want one. But I was wrong. I ended up with one that wasn't the best, and I am sad about it. My husband and I watch our wedding video on our anniversary every year (usually just the highlights, and sometimes bits and pieces throughout), and now that we have a son, he loves to watch it and see mommy and daddy and ask where he is. We will be married 6 years this October, and I am glad we spent the money on our videographer, but a little sad we didn't find a better one, as the video is a great memory of the day, our guests, speeches, toasts, and our vows. It also captures a lot more emotion than the still photographs, which I did go all out on. Flowers definitely make the venue more beautiful, but if you are having an outdoor venue, which I did, as well, I tried to allow for the natural beauty of the venue to shine, and spent more on our food (we are major foodies), photographer, and a bagpiper for the ceremony (Scottish genes!). At the end of the day, the flowers will wilt and die, but the video will last a lifetime, and can be shown to future generations. I planned our wedding for 14 months. It's definitely easy to get caught up in the tiny details of everything, but in the end you wont even realize if something isn't there or something went wrong because you're just so happy to be spending the rest of your life with the one you love! It wont matter years from now! No one is expecting you to be perfect, so don't put that stress on yourself, just be happy! Also a videographer was 100% worth it! We got our highlight video 3 days after our wedding and it was the only thing I had of our wedding for awhile, so I'd get it! Definitely do a videographer! I was the same way and wanted to put more money towards my flowers. Well one of our groomsmen gifted us a videographer and it’s such a great way to keep the memories!! It looks like my opinion is less popular but we did not have a videographer and I don't regret it. You will always remember your day so if you would rather have more flowers/more expensive arrangements then go for it! Like I already said – you will always remeber your day – you don't need a video for that. So fill your day with everything you love. Look up Cross Creek Ranch Florida instagram. They have a ton of garden romantic inspiration! My biggest piece of advice is to spend money on the items that will be most photographed. Spend money on the dress, the hair and makeup, the flowers, the photography, and the videography. DON'T spend money on things that seem important but really aren't (food, decor, drinks). Those things do add to the feel of the wedding, but they are really more important to your guests than anything else. I was so worried with wanting my guests to have a good time that I spent the money on those things, and several of my guests (who even RSVP'd!) ended up not coming, so it was just wasted money. If I had to do it all over again, I'd invite fewer people & spend even less on food and decor. At the end of the day, they really just don't matter. I got married a few months ago and we did not get a videographer because of the cost. I don't regret it because by not getting a videographer we stayed within our budget. However, if it is within your budget then I would do it. The little story the videographers is cute but I wouldn't get one for that reason. I would love to go back and watch our ceremony and hear some of the speeches again. However, because I knew we didn't have a videographer, I worked really hard to be so present and remember every detail. If it's between the two, I would go lighter on the flowers and get the videographer. We just set the table with some candle center pieces that we made ourselves. Honestly, between the wine glasses, water glasses, plates, napkins, favors, bread, the table gets very full. We didn't have flowers on our tables (used my bouquet and bridesmaids bouquets on the head table, but that was it), and I swear no one noticed. Part of that was also our venue – it was very tiny and so people were seated on the dance floor and had to move after dinner so they could break down the tables. For us, it wasn't worth the money to have flowers on the table for such a short time. But that's just us! 🙂 Whatever you pick will be perfect because it is your day. I got super sick of planning towards the end. But it really is all worth it when that day comes. It is truly so special! Best wishes! 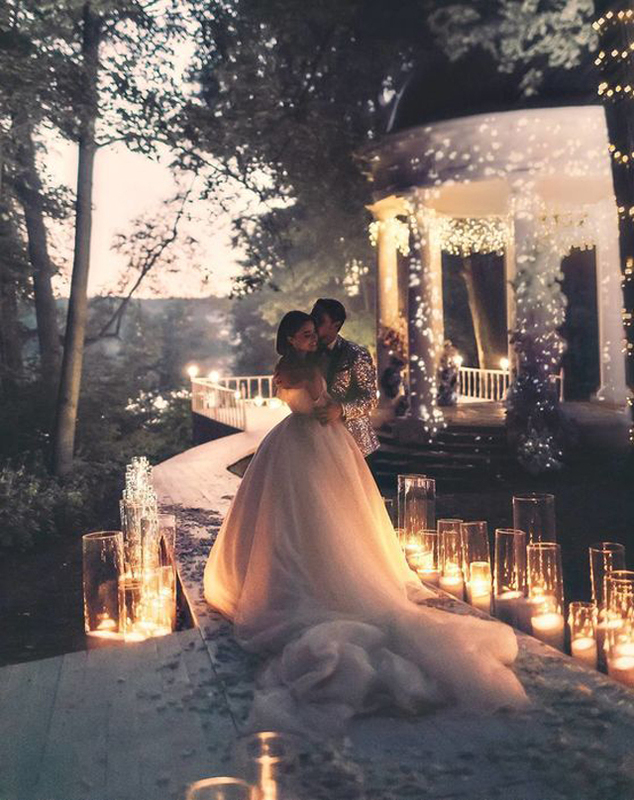 Oh my gosh I can already tell your wedding is going to be a dream!! Love the idea of a videographer! 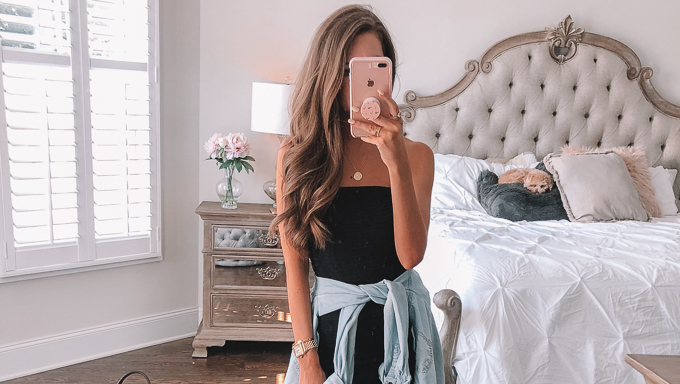 Loving the inspo picks as well! I was on the same page as you with wedding planning…it was SO overwhelming!!! I also initially said no to videographer too – I wanted to use the money elsewhere! Last minute, I decided to ask one of my younger-than-drinking-age cousins to carry a video camera around to record everything. Her older sister (my MOH) does marketing for a living, including putting videos together, was able to edit all the footage and create a 7 min video of highlights. I didnt think I would care about the videography aspect but I am SO thankful I have that footage. it was also so cool to have a best friend taking the video/someone that most guests knew because people interacted with her/the camera in a way that someone hired wouldn't experience. If you don't want to spend money on it, its worth thinking through the skills that the people you know have – someone out there would probably love to help you out! Good luck with the rest of your planning! Most definitely yes to a videographer! I am so thankful every day that we used one. And today with all of the new technology like drones to take aerial shots and stuff like that, you can get one that is INCREDIBLE. My cousin's wedding video is out of this world! Thank you so much for this post! Again, I am so happy and excited for you. Love your theme so far with the romantic fairy lights etc. We are going cake tasting on Friday, I think that is what my fiancee has been most excited about lol. Love your ideas! We almost skipped the videographer because of money, but I'm so glad at the last minute we didn't. We ended up hiring a really talented AV high school student so our video is very basic but it's so special to go back and watch the vows and speeches and first dance. There's something so special about watching it instead of just looking at photos. I recommend one, plus now there's some really really cool videos out there!! I am sure you're wedding is going to be beautiful! Highly recommend the videographer! Photos and videos are the only part of the day that lasts after the day is over so it is so worth it! We did a "highlight reel" wedding video (it's about 15 minutes long) of the whole day and it includes messages to each other, our vows, and all the big moments of hte day. We also have a video of all the toasts/prayers at our wedding. It is so special! We watch both of themevery year on the anniversary. I would definitely recommend it! My biggest regrets is not getting a videographer! I thought a great photographer would suffice. Although our wedding album is beautiful, we hardly look at it, and we only printed off a couple images. I wish we had a video we could watch (and someday our daughter can watch) that captures the emotion, sounds, movement, and facial expressions of us and our family members on our wedding day! I think it is a MUST-HAVE! Love your wedding ideas!!! A videographer is totally worth it! I got married in October and watching the video back is amazing! You get to see your guests dance and interact, it was fun watching them have a good time. Also watching back the ceremony was great, you kind of get lost in the moment during the ceremony so watching it back I was able to see focus more on the words and how it all went! Just reliving it again on screen and how you got ready made it so worth the money!!! Good luck with your decision! I highly recommend a videographer! This was something we debated for a while and almost didn't book. But, ultimately we wanted to look back on our wedding day with more than just photos. The video captures SO much more than a picture. We watch it throughout the year, and I can't wait to show our kids someday! Seriously, when I hear someone say they have a regret about their wedding day it's that they did not book a videographer. I highly, highly recommend Rachel at Along With You (http://alongwithyoucreative.com) – she is amazing. Four of my friends have booked her as well since our wedding, you really can't go wrong with her! Good luck!! I've been happily married for 37 years, and have three children all happily married as well (#blessings !!) My bit of advice is to make sure your marriage is more beautiful than your wedding! I wish you and Chris a lifetime of joy and happiness! Can't wait to see the wedding!! This looks like it will be beautiful! Go for the videographer! We struggled with that decision too, and at the last minute I asked my cousin's husband to film for us. He used some iPhones to get different angles and compiled the ceremony footage and added the songs. For an amateur, he did an amazing high quality job. He has his own drone and he got some really incredible shots of the venue and all of our guests (our ceremony and cocktail hour were outside)! It was really really special and if you think you might want it I say go for it. Congratulations! I'd honestly invest in a videographer. I mean these are LIVE memories. It's totally different than what photos can capture. Your flowers are just going to be for a day while this video will be a lifetime. But if you BOTH agree or could care less for a videographer than don't get one but if one does, I'd honestly get one. I got married last June and did not get a videographer. I do not regret it at all! I felt the same way about it as you…rather buy more flowers ha! I think I'd watch the video at the beginning if I did one but then kinda forget about it. Pictures are what you hang up and look at all the time! Your wedding is going to be beautiful. Looking back, I think having someone capture video (as well as pictures) is probably the only important thing. I couldn't tell you what my flowers looked like, what we ate, etc. I barely remember what the bridesmaids wore. I think having a video of your wedding is a good way to remember it. It's worth it. So… I had a videographer because all of our grandparents were too old to travel. We went with a friend of my brother's. That being said, I spent quite a bit on flowers and it was so worth it! We never watch the video but I look at our photo album all the time, and the flowers are still one of my favorite parts! I would highly recommend a wedding videographer! When I was planning my wedding 5 years ago my mom didn't feel like the videographer was worth it (she of course was thinking of her own wedding video that was shot with one of those old school video cameras and is shaky and poor quality) —BUT it was so important to me that I picked up extra shifts at work (I'm a nurse) for one month to pay for it. To this day my entire family and my husband (who was also skeptical) tell me over and over again how glad they are that I got the video! We watch it at least once every year on our anniversary and it's so awesome to relive the day. You also pick up on a lot of stuff you didn't even remember happening since the day is so chaotic. My grandfather passed away one year after I got married and the video captured him cutting in to dance with me during the father/daughter dance and this ALONE was worth all the money! To be able to relive this special moment with my beloved grandfather is truly priceless. It's definitely worth the money!! Hi! If you read any list of post wedding regrets, videographer is always at the top. When I got engaged last February the first thing my cousin told me was get a videographer. She said the day flies by and you won’t remember everything even if you think you will. Flowers die and you won’t take most of them home… that video will last forever. Consider it if it’s the budget! We got 1 level up from the basic package which started at 2k in my area. Not that bad! Don't skip out on a videographer. There are so many moments of your wedding day that you will miss. Still photos are amazing, but they don't capture the words, the sounds, etc. I barely remember walking down the aisle & saying my vows. It's a blur. Having the video lets me relive the moment and see all of our careful planning from our guests' perspective. If you splurge, do it here! I am right in the middle of wedding planning for my wedding in May! I’m going for classic, southern, garden wedding also! We are going with a “clear” tent outside a history southern mansion in my hometown in southeast Alabama! I completely understand the videographer vs debate! I was there myself. I decided to go with Lance Holloway of Holloway Productions (filmed weddings like Jason Dufner-PGA golfer and Nick Saban’s daughter!) because videos last WAY longer than flowers and it is how your really remember a night that becomes such a blur! All of my friends that did not have a video have seriously regretted it! I also went with Jenny Yoo bridesmaid dresses from Bella Brudesmsids (Nationwide chain with TONS of options) in Caspian Sea- however, they have a tone of pretty pink/blush options if you are going for that! I wish you all th best!! I didn't hire a videographer and have zero regrets. Instead we hired an amazing photographer who captured all the details of our wedding day. My husband made a gorgeous wedding album for me for Christmas and honestly there's nothing like looking over beautiful photos. Maybe this is just me but I find there's something cheesy about videos played over even cheesier love songs. We had a wedding videographer and I would honestly do it again! We went with a shorter highlight film to help stay within the budget and the guys we used gave us the option to upgrade to a full length video after viewing our highlight film, but it was still very expensive for newlyweds and we were pleased with the highlight film! They had videotaped the entrie day so that was how there was an option for a full length film the extra costs would have been his editing! We love watching the film on our Anniversary and having the ability to in a way relive the magic of that day! We had a videographer and I’m glad we did!!! A videographer for us was SO worth it! Yes the pictures are gorgeous and I have my favorites on my walls and I made a beautiful book from them. But years later that video from our wedding is worth everything. Rewatching so many moments that are so much more emotional on video than looking at a picture is priceless for us. Watching my husband cry when I started walking down the isle, to quick little interviews with some of the guests including those I love and have passed since then, to watching everyone laugh hysterically at the garter belt scene to moments from before the wedding to the reception and on and on, I'm so beyond grateful that we chose to have one. Love the inspiration photos, looks like it will be amazing! I just got married in September and I’ve got to say video clips capture such different things that photos just can’t. I wasn’t a huge fan of paying a ton of money for 10+ hours of raw video I’d rarely ever watch so we went with a cinematographer instead. A lot of wedding vendors offer this now. They basically only capture short important video clips throughout the day — a few short video clips or Live Photo’s whole getting ready, walking down the aisle, the ceremony, the entrances, first dances, speeches, the big and important stuff. Usually they will then give you those raw video clips but also create edited videos mixed with photos, video clips and music. Mine provided a trailer that was 5 mins and a sneak preview and she then provides a 30 minute full edited video of the day from start to finish. It was less expensive and gave us things we will actually watch and use in the future. Looking at my photos and then looking back at our videos I’m really happy we did both! I am in the midst of wedding planning myself, as our big day is in July! We opted to go with the videographer after contemplating it for weeks. A friend of mine put it best, after the day is done, all you have left is how you documented it. The more forms, the better. We felt like the video offered a really unique perspective that couldn't be captured in pictures alone, and spent most of our budget on the photography and videographer. The other stuff is super important, but at the end of the day, you want to ensure you have memories to last a lifetime. Having said that though, if you feel you may never watch the video again, then it may not be worth it for you guys. But if you can find the money in the budget, I think it would be incredible! It’s also a great way to share memories with friends and family after the fact, and even a great thing to show your future children one day. 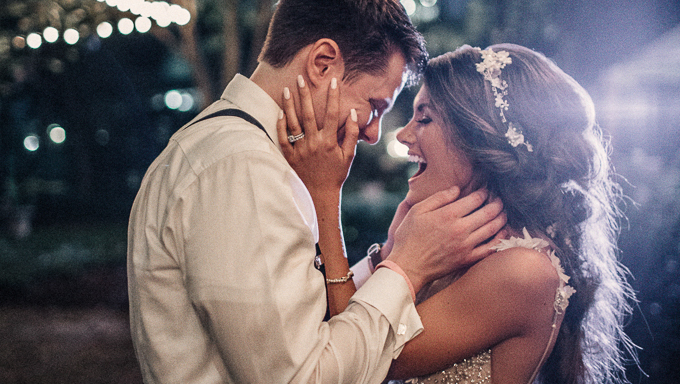 There are some great videographer options out there too, and options for every price range! Yes definitely! My sister had one and they have a long version and short version. Ten years later with three kids they love to watch the (short version) film!! The kids love to watch their parents and a great reminder of such a special day to share with their children. Definitely worth the splurge!! Ok, I didn’t do a videographer and had my uncle film our ceremony using his camcorder. We’ve been married 5 years and never watched it. LOL. But my wedding pictures…I’ve looked at them a million times. I went all out on linens and floral, my flowers looked a lot like the ones you liked too! Worth it worth it worth it in my opinion to splurge on decor, it’ll make the event beautiful and live on forever in your pics! We saved a lot of money by just doing beer, wine and champagne vs full bar. Oh and…photo booth…we did this and I thought it’d be cheesy but it was SO fun. Those pics our guests took (we got a copy of every pic taken that night), are some of my most favorite. Also, I didn’t see grooms gift on the planning sheet. I got my hubby boudoir pics and gave them to him on the day of. You’d need to plan that or any other day of gift in advance too. So exciting! LOVE this post!! I was hesitant about getting a viedographer as well when I got married in Charleston in September 2016, and it was a last minute decision for me, but it was SO worth it! We honestly watch our wedding video more then we look at our pictures! 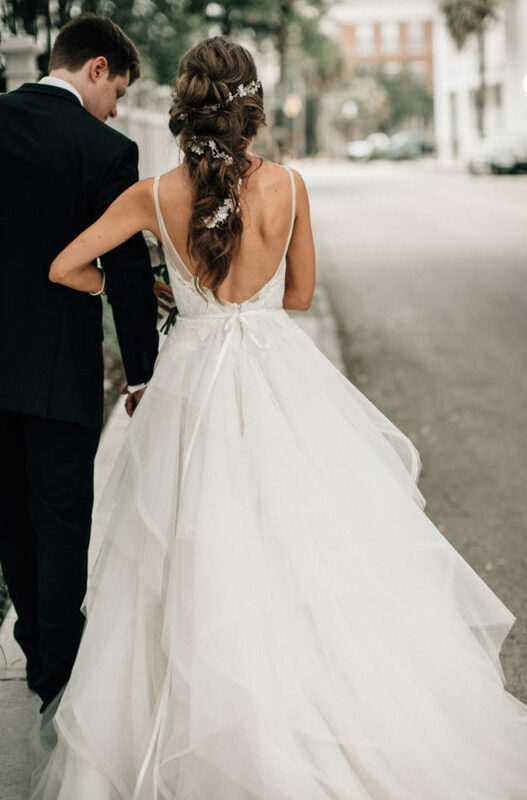 We used Dockhouse Digital (they're local in Charleston), and they were absolutely wonderful, the video quality is amazing and we hardly even noticed they were there, they were so discreet yet captured so much! I would HIGHLY HIGHLY recommend them! It sounds like you will have a lovely wedding celebrating the love you have for one another. That being said, from the experience I had at my own wedding, I highly recommend getting a videographer. They can capture the day in a very different way than your photographer (which was also extremely important to me as I am a photographer myself, so I totally get it). My only advice, if you do choose to hire a videographer, make sure that everything is extremely clear as to when you will receive your finished product. I was told four months after our wedding but we ended up not getting it until just days before our first anniversary. It was a very upsetting experience dealing with them with post-production and agrivating that they couldn’t be honest with me about the true timeline. Enjoy the rest of your planning, it can be stressful and overwhelming but if you can stop and slow down to remind yourself why you are doing it all the stress will melt away! All the best! Your wedding inspo looks amazing, I'm sure it's going to turn out beautifully! Charleston seems like a magical place and I can't wait to visit in April for the first time. Sounds like you are rolling along in the wedding planning process! I would definitely invest in a videographer. We found ours on The Knot. Pretty inexpensive for the package we picked. But definitely something to consider since everything is so digital now. A lot of our friends have said they did a video for their future kids. They think they’ll enjoy it more than just photos. Absolutely worth it! I know so many girls who have regretted not doing it. My girlfriends all begged me to do it, because they regretted not doing it and I did not listen. I would give anything now to be able to relive that day again and hear voices and see how my dress swished when I walked. I think pictures are amazing and an incredible asset to invest in but film allows you to FEEL and hear and remember things in a totally different way. No flower is worth being able to hear your wedding vows again or your best friends toast. Get a videographer! We hired a videographer and it was absolutely worth every penny. Our pictures were amazing, but there’s something about watching a film of your wedding. They created this highlight reel that was about 6 minutes long and it was the perfect recap of the day. I missed some of the wedding day activities (groom getting ready, his friends and parents with him, people walking in to the church while I was hidden, etc) and it was so nice to see all of that! My husband and I recently got married in September and we did not have a videographer. We do not regret it at all! We decided to use that budget to splurge a little more on a photographer and DJ we both loved. Wedding guests will always remember the food and dancing! I disagree. You will remember your own but if your guests have been to a few weddings the food and dancing all blend together. And even our own, after 10 years I remember some of the food but not much! I was dead set AGAINST a videographer when I first started planning because I felt like pictures would be enough and I didn't want to spend the extra money. Then I started researching and talking to friends and changed my mind. One of the most compelling points I found was that as the bride, you actually miss A LOT of your wedding. You don't get to see your mother and grandparents walk down the aisle or your bridal party's entrance or anything that happens while you are busy taking pictures/cutting cake/etc. Someone also told me that your wedding is the only day when everyone you love from every part of your life is in the same room and HAPPY. A family member shared with me that he loves his wedding video even after 10+ years because some of his loved ones who were there have passed away and in the video he can see them as their true selves– their movements, how they spoke, their laugh, their dance moves– which is more than a photograph alone can capture. I am getting married in May so I can't say anything yet about the finished product but I love our videographer and it is now the aspect of our wedding that I am most excited about! I'm married almost 11 years now, and I almost didn't book a videographer. But at the very last minute we did – but we picked someone who was VERY inexpensive. I didn't want something elaborate, I just wanted a recording of the day. Now that I have a 6 year old, I'm glad I booked it. She likes watching the video now and again, and seeing what her mama and daddy looked like on the big day. It's truly more for your children than you – and that makes it worth the money. I would 185% recommend getting a videographer. We didn’t and that is my only regret when it comes to my wedding day! It helps you look back at every moment, even the ones that you would never remember or maybe didn’t even notice. We didn't have a videographer and 8 years later, I can say that I don't regret it. While it would've been nice to have a video, I much preferred spending money elsewhere. Particularly food, cake, and pictures. People still talk about how good the cake was. And I was told that when planning my wedding, to spend my money there since I'll have pictures to look back on and guests will remember and appreciate food more. I did make sure to have a good budget on my dress and flowers though. But I probably spent "more" on cake and pictures than what is typical in my area (Kansas City). Plus I didn't want to have a videographer blocking anyone since we already had two photographers. I got married almost 25 years ago (yes, I could be your mother, haha!) and I am sooooo glad we sprung for a videographer. Back then it wasn't the thing it is now, but we found this guy that was kind of ahead of his time. My photos were rather stiff and staged (hello 1995) but I used to watch the video over and over and over. Like someone else said, the day will be a blur and you won't remember much. Having the video to watch afterwards is so much fun. I would totally cut back on flowers and spring for the video. Hello! I just got married (1 month ago tomorrow!!!) and I had a huge dilemna on the videographer. I have two older sisters who got married years ago and my parents really didnt understand why videographers went from being like $800 to thousands and were very anti spending the money. I finally talked them into paying for half and I paid for half. We just got our video back yesterday and it was worth every penny. One thing that you will be hear a lot is how quickly the day goes by and how its all a blur-THIS IS 100% TRUE. I was so excited to get the video back so I could re-live our ceremony and speeches from my dad, sisters, and Best Man. I would highly suggest getting a videographer. This is something you will have forever. Also there are many videographers that dont break the bank! Just takes a lot of research :/ Best wishes to you and your fiance—I miss wedding planning so much. I feel like I relate to your comment so well feeling like the day had to be perfect-it will be no matter what because its your day and a celebration of your love which is perfect!!! 100% get a videographer- you won't regret it! Photos are amazing but looking back and seeing all the emotions and movement on video are so different. Plus put it all to music and you will have something to cherish forever. Flowers are beautiful and all- but I'd say guests care the most about the good food and music. Can't wait to see how it all turns out! I’m currently planning my own wedding and my number one thing was having an AMAZING photographer! I worked in an industry where photography was key, so I was picky as well! To me, if you have an amazing photographer that produces stunning photography, there’s really no need for a videographer because the pictures tell a story themselves. So for that reason, we are nixing a videographer! I’m getting married in July, and have been convinced by several of my friends that we HAVE to have a videographer! I really didn’t want to spend the money on it, but have been told that the day ends up being such a blur in so many ways that it’s really wonderful to have several different art forms capturing everything 🙂 Anyway, we are going with Mary M. Cinema (marymcinema.com) — she has been really wonderful and responsive so far, and worked with us to find the right package for our budget. I'm getting married in September and I decided to hire a videographer! Everyone kept telling me it's one vendor you will absolutely not regret having! I can't wait to be able to watch our videos for years to come and show them to our future kids! The pictures are of course there too but to be able to hear your vows again and all of the speeches is 1000% worth it to me!! You are the first blog I have followed. When I became a first time Mom last year I wanted to enjoy reading something that would help be in touch with the world when I was up late in the night doing feedings. I truly reading your blogs, how genuine you are, easy reading, the diversified topic you capture. I would recommend getting a videographer to record your special day. We have enjoyed seeing it again, sometimes we catch something that we missed on that day and have a great laugh about it, others will get to see it as well …we are looking forward for our daughter to watch it when she's a little older. People overlook having a videographer but It's worth it! These inspiration photos are beautiful! Your wedding is going to be amazing. I got married in December and a few things went wrong but I was so happy on that day I didn't even notice- it felt perfect to me. Please please please get a videographer. The flowers last for a few hours, the video a lifetime. I've been married for 25 years and have four children. It's so much fun for them, and us, to watch it all over again. You remember the feelings that went through you and you hear the voices of all the friends that shared the special day with you. It's a MUST! 100% recommend having a videographer! So much about the actual day is fleeting and having the video to watch is totally worth the cost, in my opinion. Check out Inkspot Crow–their videos are GORGEOUS. I am getting married in July. We opted to not have a videographer. I personally did not want to be videoed all day because of nerves and I felt like I really am not going to watch it as often as I think. We are spending that money on more hours with our photographer and more flowers! 1. We did NOT hire a videographer and I don't regret it one bit. So many of our friends had candid videos through out the night, I didn't feel like it was needed. And with such an amazing photographer, you'll have every moment captured. 2. ENJOY the wedding planning process! You'll miss it when its over! I too planned our wedding long distance and would get stressed out easily, but enjoy it….if something gets screwed up the day of, no one will know but you! Remember to enjoy the getting ready process with your girls and enjoy as much time that night with Chris as possible. It's the start of a beautiful life together and no matter what happens, it will be absolutely perfect!! and will still watch the highlight video all the time! It captures moments from getting ready, ceremony/reception, dances and speeches. 7 minutes doesn't seem like much, but really all you need. As far as flowers, although they are beautiful, you can’t take them with you and you will hardly notice in photos/video. Don’t blow you budget on them. A video is a must! Years after the special day, you can watch it and fall back in love with that once in a lifetime day. You can hear all the sweet voices, laughter, and it takes you back to that exact second in time. Time flies quickly and since you seem sentimental, I think it is totally worth it and will treasure it in 5, 10, and 50 years later. Congrats! Definitely hire a videographer. We have 4 kids (8,6,3,1), and my older kids especially LOVE to watch our video since they weren't even in existence yet. It's money well spent. Flowers will die, the video will live on FOREVER!!! Unpopular opinion: We skipped the videographer and I don't regret it one bit. Maybe because I don't know what I'm missing? But when I think long and hard about it, I don't feel like I'm missing it at. all. We stayed exactly within our budget, so I'm happy I didn't cut elsewhere just for the video. We decided to extend our bar in the middle of the wedding and party longer, so I was glad we weren't already over budget! My husband and I work in TV news, so the last thing I wanted were CAMERAS following me around on a day I was supposed to enjoy. I didn't want it to feel like work. Our photographer made it feel like she wasn't even there, yet she captured every, single minute and detail. It's art that I can literally stare at and marvel…that's enough for me! The news station I worked for at the time did send a photog to take video of the ceremony; it's nothing artistic but we do have that on video. To be honest, we watched it one time and that was good enough for me haha. I find a lot of the wedding videos to be super corny and dramatic, and that's just not my style. But if you're super sentimental, you might like to have it. On the flowers, while I would have loved to have a ton, they are SO expensive that I went all out on my bouquet and our ceremony flowers and did non-floral reception centerpieces that were gorgeous for a portion of the price. Good luck planning…I did it all myself and the last couple months were INSANE. But then it's over in what feels like half a second, so ENJOY IT! I vote for a videographer, too! Everyone who I have talked to that did NOT have one, regrets it. I completely recommend getting a videographer. I didn’t end up booking one because we felt it was unnecessary but then one of our wedding guests ended up bringing his video equipment and videotaped our entire wedding. It was the best surprise ever and I would have regretted not getting one. While you don’t watch the video that often, nothing can capture the memories like a true replay. Also the day will go so fast and you’ll be glad you can go back and relive it! I was on the fence about this too, but I have heard so much from friends that a videographer is the way to go. Two friends that were on the fence about it but did it told me after they were so glad they did. I think it would be such a fun way to relive the day. Best of luck to you and Chris with the rest of the planning! You MUST have a videographer at your wedding! I’m married over 10 years now and it’s fun to look back and relive those special moments, the ceremony, the dancing, the speeches!! My kids love watching it too! My favorite party is the 2 minute highlight clip. You won’t regret it Caitlin! !’ You will want to remember relive it, it all goes by so quickly and a video, brings back those moments- priceless!!! Number one piece of advice I have received wedding planning of married friends : they could have lived without the all the flowers, very much regretted no videographer. I have friends who spent $10,000+ on flowers and didn’t even see half of them!!! A video you will have to watch a cherish FOREVER!! Flowers are beautiful, but a little goes a long way and at the end of the day, a video is forever, flowers are for a day! 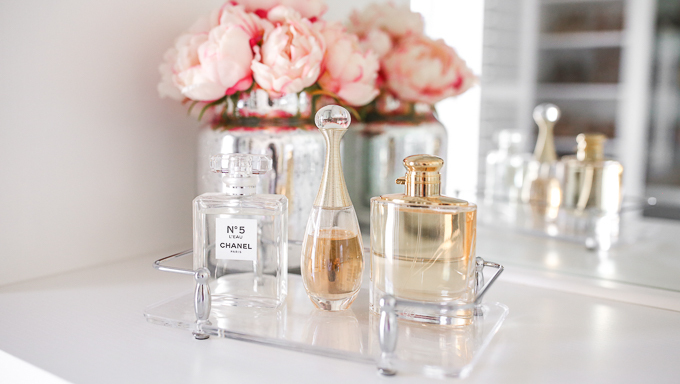 And I promise you, those extras you think can’t live without, you wouldn’t even notice on your big day!! A video, you could snuggle up with your honey on a rainy Saturday afternoon with a glass of wine and reminisce on the best day of your lives!! Good luck with all your planning!!! I absolutely LOVE everything! It is amazing seeing someone who has the exact same taste as I do, share all of these photos and events because I truly LOVE everything and even have pinned almost every single photo myself!!! 💗 I know you probably have such amazing ideas shared to secret boards on Pinterest lol maybe next giveaway I can win by being added to your secret boards on Pinterest������ I can not WAIT to see your gorgeous wedding and all the more to come! !